During IFA held in Berlin, Sony not only released its flagship Xperia T, but also launched other two Android-based smartphones: Xperia V and Xperia J. The configuration of Xperia V is similar to Xperia T. Xperia V has cancelled the green ball design on the back, adopted 1.5GHz dual-core processor, with 13-million-pixel rear camera, run on Android 4.0 ICS operating system and supported NFC technology. What differs from Xperia T is that it is equipped with 4.3-inch 720p HD Reality screen and is going to support LTE network in American area. The Xperia J is with lower configuration: 4-inch 854×480 display, 5-million-pixel main camera, 1GHz CPU, and has black, white, golden, pink four colors for options. Although the configuration is not as high as Xperia T and Xperia V, it is quite awesome in appearance. Sony new flagship Xperia T was called Mint previously. 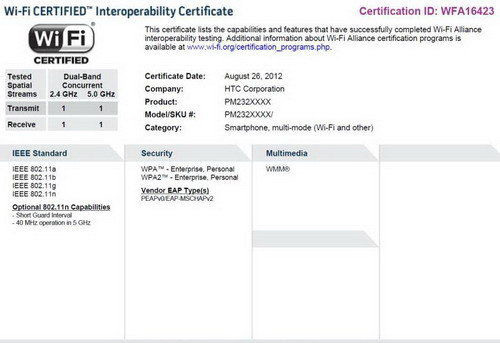 And rumors about it started from January this year, it comes out in 2012 IFA finally. The highlight of Xperia T lies in the 4.55-inch 1280 x 720 Reality screen. 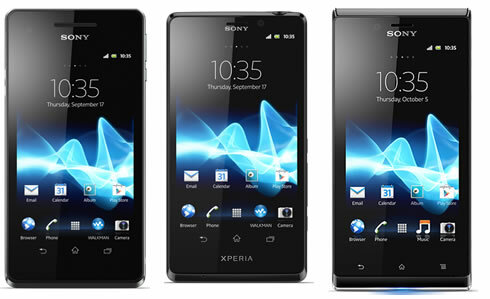 Sony claims that it is the best smartphone for HD experience which allows users to enjoy 1080p HD video on Sony phone. Xperia will run on Android 4.0 operating system but Sony does not mention when the users can upgrade it to Jelly Bean system. As to the camera, Xperia T has 13-million-pixel camera, 1080p video recording support, and the function named Sleep Snap lets users to regulate to the picture shooting state from black screen state. Other configurations included in Xperia T (Xperia TX) are: 1.5GHz Qualcomm MSM8260A Snapdragon S4 dual-core CPU, front-facing camera with 720p video recording function support, MHL, FM radio, 16GB memory, 1850mAh battery capacity and NFC function support. In appearance, Xperia T is 9.35mm thick, weighs 139g, and has black, silver and white three color for options. In addition, Xperia allows 60-day wireless music experience. But when this phone will be put into the market remains unknown yet. Galaxy series has brought great success to Samsung in smartphone filed, but it seems that Samsung is not going to expand it to WP8 system. News from media reports stated that recently Samsung has registered Ativ trademark to be the name of WP8 product. 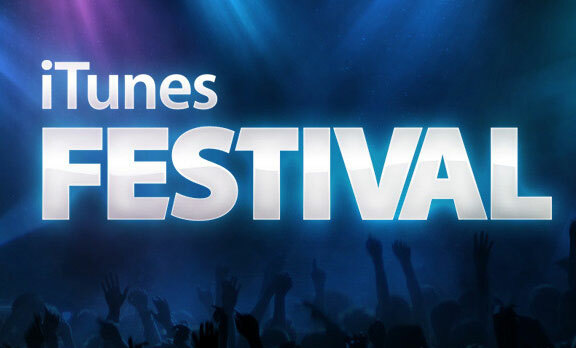 It is with the implication that Nokia WP8 will show up with brand-new appearance. Two names are included in Ativ trademark: Ativ Tab and Ativ S. For people who are familiar with Samsung products, it is quite easy to understand. 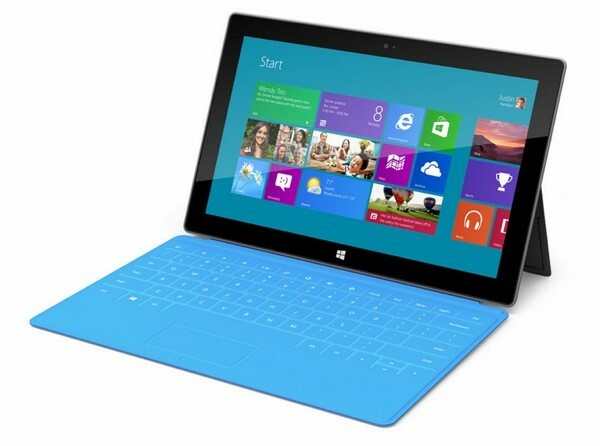 Obviously, Ativ Tab belongs to tablet PC product. And it is believed that if Samsung does not make strategic adjustment on its products, Ativ Tab will be the exclusive name for Windows 8 tablet. The naming rule of Ativ S will easily make you think of Samsung Galaxy S series. With the same rule, if the product strategy is not adjusted greatly, Ativ S will be the exclusive name for Windows Phone 8 smartphone. Although it is uncertain when the new trademark will be taken into uses, it is for sure that Ativ S will appear in Samsung WP8 flagship phone model. The current information indicates that new Samsung mobile phone GT-i88750 with Odyssey coded is probably to be the first model of Ativ S series. It mainly features 4.8-inch Super AMOLED touch screen, supports 1280 x 720 HD resolution that is awesome for you to watch video on Samsung phone, and is with built-in 8-million-pixel camera. And also the NFC function makes Wallet Hub and “Tap+Send” functions possible. This new handset is also equipped with 1.5GHz Qualcomm Snapdragon S4 MSM8960 dual-core processor, double-camera design (1.9-million-pixel front-facing camera and 8-million-pixel main camera), 16GB/32GB editions for options, memory card expansion function. The official release date of Samsung WP8 phone remains unknown, but related sources show that it will not be launched until October. Unlike the high-key Nokia WP8 new devices, the first HTC WP8 phones hold low exposure rate. Currently, after the leaked information of HTC WP8 two new phone models, the latest information coming from Indonesia telecom regulation website shows the specific model of HTC WP8 new phone for the first time. New HTC phone exists on Indonesia telecom regulation website is specially marked with the WP8 system status, the formal model is HTC C620e. Although no more valuable information about this new phone has been leaked, we can still speculate that the WP8 phone labeled “PM233xx” is likely to be the prototype of this new phone. And judged from the previous information, HTC Accord is closer to HTC C620e in specifications. HTC Accord is included in the previous media report which is scheduled to make a debut in October this year. This conclusion bases on the fact that the first HTC Mango new phone’s model is HTC C110e (HTC Radar), so according to the HTC naming rule, HTC C620e should be a high-end phone model. 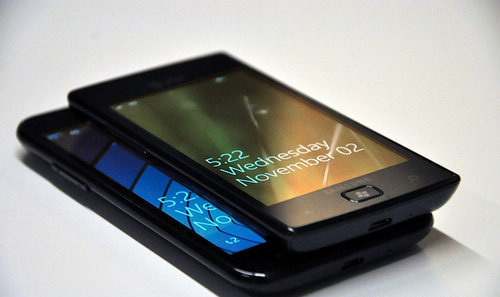 And the past leaked information indicates that the first HTC WP8 phone will be “Rio”, or “Accord” or “Zenith”. The most powerful “Zenith” will be released in the fourth quarter this year, and also the “HTC Rio” is a new entry level model, so “HTC Accord” can be the first choice naturally. It is reported that “HTC Accord” will be equipped with 4.3-inch 720p Super LCD2 touch screen, with 8-million-pixel built-in camera which supports 1080p HD video recording. Besides running on Qualcomm Snapdragon S4 MSM8260A dual-core processor, it has 1GB RAM and supports NFC function. According to the exclusive disclosure from WPDang, HTC is planning to release the first WP8 phones in the third week in September this year. And at the appointed time, there will be two phone models. And in October they will probably be put into the market. The current situation shows that the preparation works of HTC WP8 are being fulfilled step by step: Bluetooth testing, Wi-Fi authentication, test and audit in various countries and regions. So it is expected that in the near future, we can get access to HTC WP8 phone. The Exynos chip which is developed exclusively by Samsung has become a powerful assurance for the hot selling of Galaxy series products. In July, the technical white paper of the latest Exynos 5250 chip has been released. The information shows that Samsung Exynos 5250 is the first dual-core processor based on Cortex-A15 core design, taking the lead in supporting dual-channel 800MHz DDR3 memory. The new processor will employ Cortex-A15 HKMG process, supporting WQXGA resolution. More powerful processing performance and lower power consumption will be brought by this new processor. Although the flagship Samsung Galaxy S3 does not adopt this new processor, the popularity of Samsung Galaxy Note makes it possible that this powerful processor will be applied to the device. Because of the large screen, the first generation Samsung Galaxy Note has won great popularity. The previous 5-inch display has met with the visual requirements of users. And now it is speculated that Samsung Galaxy Note 2 will be enlarged to 5.5 inches. 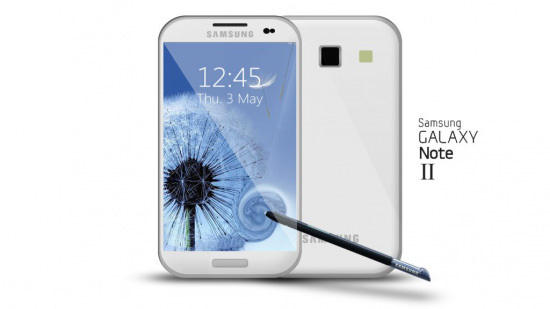 Seen from the screen leaked, Samsung Galaxy Note 2 screen is up 5.5 inches. And also the appearance will also adopt the water droplet model that is similar to Galaxy S3. Although the size has been enlarged, there is no obvious change when holding the device for Samsung has adopted the advanced narrow border design to enhance the user experience. The upgrade on hardware is always the motivation users buy the device. Smartphones in the current market are with 1GB RAM, including the international edition of Samsung Galaxy S3. It is for certain that Samsung Galaxy Note 2 is with 2GB RAM, which is used to compete with the next generation iPhone device. Besides the 5-inch screen, the S-Pen contributes a lot to the success of Samsung Galaxy Note. So we can expect that new functions will be added to S-Pen. All photography professionals know that there is no absolute relationship between the picture quality and the resolution. Sensor, graphics chip and processor are all the important elements in photography experience. If more powerful CPU is put to Galaxy Note 2, there is an absolute upgrade in image quality. There have been two months since the release of Android 4.1 Jelly Bean, but almost no mobile phone supports this new OS in the current market. Barring accidents, Galaxy Note 2 will be the first Samsung phone that is running on Android 4.1 Jelly Bean system.